Graphene is a two-dimensional carbon allotrope. It is composed of carbon atoms positioned in a hexagonal design, which can be said to resemble a chicken wire. 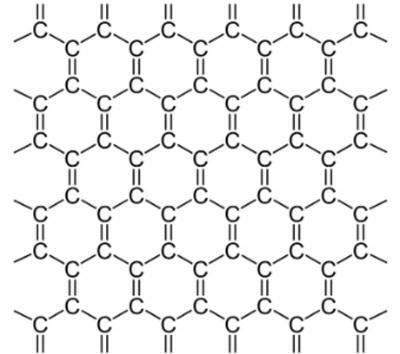 A single layer of carbon atoms arranged in such a honeycomb structure forms a single graphene sheet. Several sheets stacked one on top of the other are regarded as multi-layer graphene, up to the point where the material becomes graphite (usually over about 30 layers, although clear standardization is severely lacking at the moment). Graphite, a 3D crystal composed of weakly coupled graphene layers, is a relatively common material - used in pencil tips, batteries and more. In graphene, each carbon atom is covalently bonded to three other carbon atoms. Thanks to the the strength of the covalent bonds between carbon atoms, graphene boasts great stability and a very high tensile strength (the force in which you can stretch something before it breaks). Since graphene is flat, every atom is on the surface and is accessible from both sides, so there is more interaction with surrounding molecules. Also, the carbon atoms are bonded to only three other atoms, although they have the capability to bond to a fourth atom. This capability, combined with the aforementioned tensile strength and high surface area to volume ratio of graphene may make it appealing for use in composite materials. Graphene also enjoys electron mobility that is higher than any known material and researchers are developing methods to use this property in electronics. Using graphene, it should someday be possible to make transistors and other electronic devices that are much thinner than devices made of traditional materials, and this is only one example of graphene’s potential in the electronics field. Since graphene is electrically conductive, transparent, strong, and flexible, it may also be an attractive material for use in touch screens. Graphene also has very high thermal conductivity and so, could be used to dissipate heat from electronic circuits. 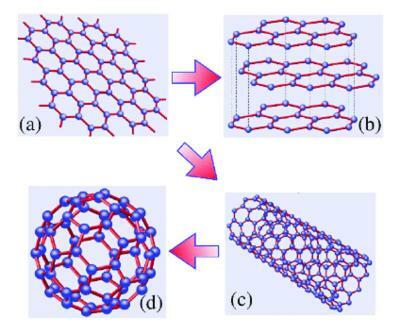 Graphene can be a parent form for many carbon structures, like the above-mentioned graphite, carbon nanotubes (which can been viewed as rolled-up sheets of graphene formed into tubes) and buckyballs (spherical structures with a cage-like structure made from graphene only with some hexagonal rings replaced by pentagonal rings). Graphene is one of the first and most famous examples of a 2D crystal. Two-dimensional materials and systems are fundamentally different from three-dimensional ones in many ways. Graphene can be used as a model system for studying two-dimensional physics and chemistry in general, and so has been attracting much academic interest since its isolation in 2004. It is also considered to have tremendous potential for a myriad of applications, like next-gen batteries, sensors, solar cells and more - thanks to a wide array of properties, some of which have been already mentioned in this article, like excellent electrical and thermal conductivity, mechanical strength, unique optical properties and more.